(June 21, 2016) – The Portland Bureau of Transportation (PBOT) announced today that it will begin installing 29 parking meters along selected streets in the Central Eastside Industrial District (CEID), including along E. Burnside, NE Grand, NE MLK and SE 6th Avenue (see map below). The bureau will also upgrade 13 older meters with the latest model. With this installation, PBOT takes a significant step toward implementing the next phase of the Central Eastside Parking Management Plan. 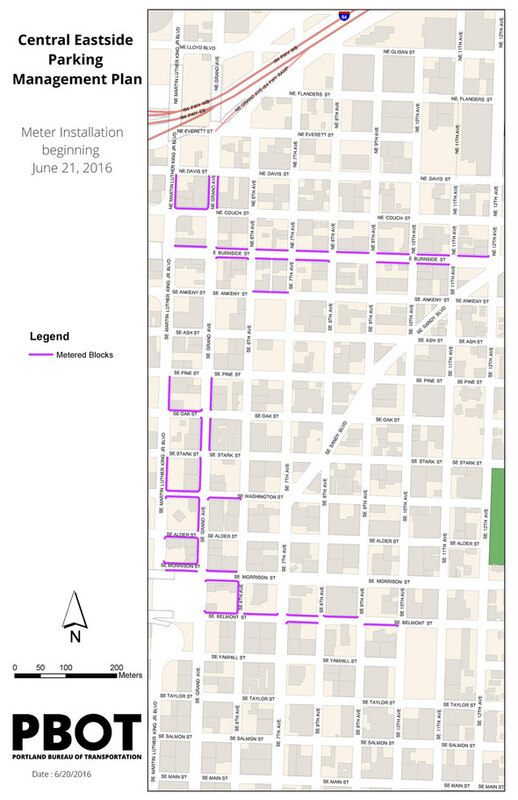 Adopted by City Council in June 2012, the Management Parking Plan was the result of a collaborative planning process between PBOT, business owners and neighborhood representatives. The Central Eastside is already seeing an increase in density as a result of ongoing residential and commercial development in the area. As a result, the Central Eastside Industrial District continues to work with PBOT to manage the increasing demand for limited on-street parking. The new parking meters will serve as an important tool in helping PBOT, in partnership with community stakeholders, work to meet this goal. The parking meters being installed in the Central Eastside are the same model installed in NW Portland earlier this year. The meters in NW Portland have performed very well, processing tens of thousands of transactions a month with extremely low rates of customer service difficulties.